4 medium or large aubergines, plump, round or long. Cut the aubergines in half lengthways and remove the pulp from the centre, leaving a rim of flesh about 1 cm thick around the sides. Sprinkle with salt and leave for 30 minutes. Wipe off the juices and pat dry.Saute the onion in a little oil, add the beef and brown lightly. Stir in the cinnamon and chopped aubergine pulp. Pour over the wine. Now add the tomato paste, seasonings, bay leaf and garlic, and simmer gently for about 30 minutes. Fry the aubergine cases on all sides in a little oil, taking care not to burn them. Remove from the pan and place in an ovenproof dish. Fill the cavities with the meat mixture. 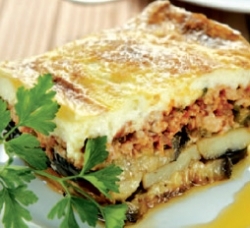 Place the filled aubergines in a baking dish, propping them up against each other or with pieces of potato, so that they cannot fall over and spill out their filling. Sprinkle the surface with a little of the grated cheese. Melt the butter in a saucepan and stirr in the flour to make a smooth paste. Add seasonings, then gradually add the milk (which should be at room temperature), beating constantly to make a smooth thick sauce. Cook very gently and then add half the remaining grated cheese. 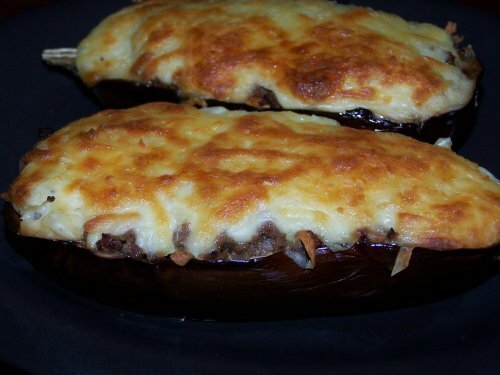 Allow to cool and thicken even more, then spoon the sauce over the filled aubergines, covering the surfaces completely. Sprinkle over the rest of the cheese, add a little water to the pan and bake at 170 C (335 F)for about 40 minutes. Allow to cool slightly before serving.